And you thought Happy Meals exploited children. Thanks to blog reader, colleague, and the Head, Food Policy Research Initiative, Ontario Tobacco Research Unit, Catherine Mah, for finding and forwarding this jaw dropper. "Key areas of shokuiku focus include over and underweight, agriculture, education, and (a key one) cultural promotion. Driving forces for the creation of shokuiku were declining public trust in the food system, changing social and cultural dynamics related to food, and concerns about domestic agricultural self-sufficiency. The policy was legislator driven, launched during the Koizumi administration days, and a national Food Education Basic Law was adopted in 2005." "about addressing food deskilling among young people: food handling (including growing and cooking) skills, food safety, learning about where food comes from, "traditional" Japanese food, benefits of eating breakfast, the food guide, healthy eating/eating patterns to prevent NCDs (in Japan, referred to as "lifestyle diseases"), benefits of eating with your family." Yes in fact, it does sound great. I wish our elementary students had shokuiku lessons. So what's the jaw dropper? The lesson plans are being drawn up by McDonald's. Unfortunately, my Japanese is a little bit rusty (non-existent), so I had to rely on Google's translation service to peek at the site. Clicking over here will take you to McDonald's shokuiku main site, while clicking here will take you to their supplementary kids' shokuiku site. I couldn't see anything awful on my cursory tour. No recommendations for French fries, no Ronald teaching class, so see, this is just an example of a great public-private partnership....or is it? I found what appears to be a chapter in a textbook written by someone named Mark Frank. It details an exercise to translate a few of the shokuiku lessons to English. The lesson for children was divided into three parts: vocabulary practice, a map exercise, and a quiz. First using picture cards the various ingredients of a McDonald's menu were introduced: Hamburger, cheese, fish, chicken, potatoes, lettuce, tomato, wheat and bun....."
So why is this a jaw dropper? Shouldn't McDonald's been praised for their work? What's wrong with teaching about food miles using McDonald's as an example? On the one hand, it's undeniably great that Japanese schoolchildren are learning about healthy eating. On the other hand, with lesson plans being delivered by McDonald's, lesson plans on healthy eating, delivered to children under the age of 12, where the lessons have children as young at 6 literally studying McDonald's menu and doing "research" on the McDonald's Japanese homepage, do you think that maybe, just maybe (and I'm being sarcastic here), that McDonald's is hoping that those school children will associate McDonald's branding of their healthy eating classes, and hence McDonald's as a whole, with healthy eating? Or at the very least are hoping to introduce an entire generation of Japanese school children to the wonders of the McDonald's menu (which of course includes the requisite kids' site)? Do you think there'll be a lesson that explicitly suggests that eating out is one of the primary drivers of obesity and chronic disease, and that actively discourages frequenting restaurants for reasons of convenience? "Our college and our community are literally surrounded by rice paddies, bean fields, and small vegetable gardens. At the same time, our college is also surrounded by the food most college students, young families and children eat: family restaurants, ramen, McDonald's, franchise restaurants and 100 yen sushi shops. Both contain mysteries; both are separated from our understanding by walls that can be overcome by shokuiku." And even putting aside the potential for these lessons to influence the attitudes of school children as to the healthfulness of McDonald's, were there ever a call out in Japan for legislation that in turn might have a potential negative impact on McDonald's ability to sell food to school children (advertising reforms, zoning law changes, Happy Meal toy bans, etc. ), do you think that their involvement in shokuiku wouldn't immediately be trotted out as evidence they're part of the solution, and not the problem? But I'm guessing such a call will be a long time coming. Why? 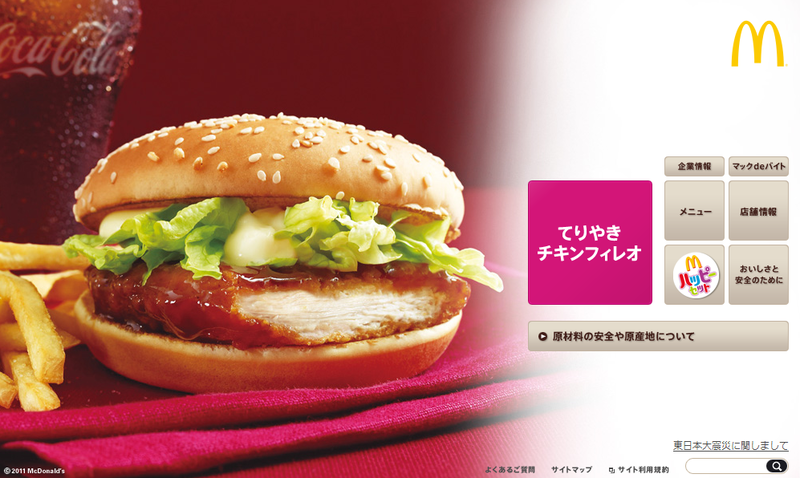 Because these McDonald's Japanese shokuiku lessons? They have the imprimatur of the Japanese Ministry of Education. So here's my question. How does one weigh the obvious benefits of utilizing McDonald's massive resources to put together lessons plans on healthy eating, with the more insidious and in many cases unmeasurable risks inherent to this public-private partnership? Truly, I don't know the answer - your thoughts would be greatly appreciated.